From the Hancock County Courthouse, go east 0.3 mile on Hwy 15/16 to the fork at the Sparta Baptist Church. Bear left on Hwy 16 to the northeast and go 5.0 miles. Turn right on Hickory Grove Church Rd. Go 2.1 miles. The cemetery is located on the southwest (right) side of Hickory Grove Church Road. It is located about 100 yards from the road, in the middle of a pasture and surrounded by large trees. 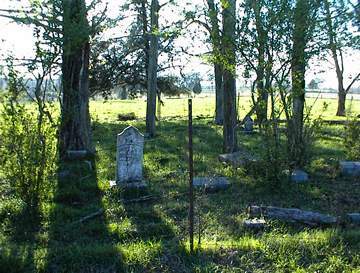 It is shown as an unnamed cemetery on the 1993 DOT Hancock County Highway Map. 3 adult-sized graves and one child-sized grave. 5 graves, one with an adult-sized slab. s/o G. H. and R. G. Moore. Not found in 2002. All info per Kimbrough.